Except in this one...Bad Hair DAY! It is partially deconstructed and ready for it's next incarnation. 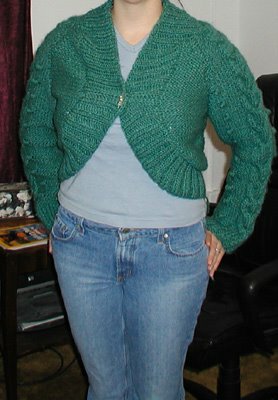 When I get depressed about all the time I wasted, and my insistance on perpetuating this viscious cycle of bad fashion sense, I try to think about the positive things I took from this endeavor: I learned how to bobble, wishbone cable, and I got more practice at picking up stitches and seaming. 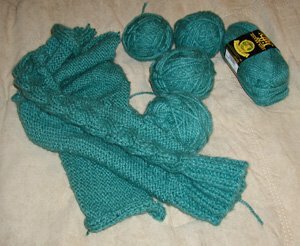 So I must search for another sweater for this lovely, slightly chunky, green yarn. I'm thinking the Hourglass Sweater from Last Minute Knitted Gifts. I put a hold on a copy at my library and will hopefully have it in a few days. Any suggestions? Awww, poor blackberry! I wish I had gotten to see it on you without the pin.. I think leaving it open might have looked nice! I'll think on a good pattern suggestion.. until then, maybe a cocktail would be in order? You could make a Mariah sweater from knitty. It's not so hard and it's close fitting and won't give you the bulkiness you didn't like with this sweater. Trust me, leaving it open made it worse. Mia, no sipping and stitching for me. ;) I partially over it already for I've started the Dayflower Scarf. My first lace, we'll see how that goes.